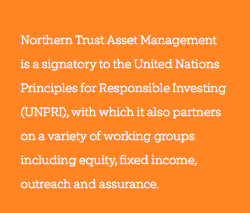 The foundation of Northern Trust's responsible investment principles, as with our entire decision-making process, is that we will act in a manner to protect our clients’ financial well-being. At the end of 2016, Northern Trust Asset Management managed $54 billion of assets globally that incorporate ESG criteria, including six ESG funds and two newly launched ESG exchange-traded funds (ETFs). With ESG trends continuing to strengthen, our ESG pooled fund platform grew to over $5 billion. Northern Trust's investment oversight solutions offer our investors comprehensive analysis, insights and monitoring, as well as asset class portfolios that include traditional market-based metrics and ESG exposures. We have a comprehensive set of investment policies encompassing responsible investing factors such as our bespoke ESG pooled fund policies, our engagement policy that pertains to our European index funds, corporate governance and internal engagement principles and our custom proxy voting policy with ESG guidelines. In 2016, we also published our Northern Trust Stewardship Statement, which touches on the company's commitment to proxy voting, engagement and transparency. Stewardship aims to enhance the quality of engagement between institutional investors and companies in order to promote the long-term success of companies, such that the ultimate providers of capital (investors) also prosper. Responsibility for stewardship is shared between companies and investors, and effective stewardship benefits both parties as well as the economy as a whole. In light of our efforts, Northern Trust Asset Management was awarded Tier 1 status by the Financial Reporting Council. Manage assets to a socially responsible index. We have partnerships with all of the leading index providers and can design additional ESG indices on behalf of clients. Manage assets to a traditional index while excluding a client-directed list of companies. We currently manage restricted accounts to most major index series across asset classes. Accounts can be managed to replicate the risk & return characteristics of the broad index or the restricted index. Manage assets to a traditional index while interpreting a client's Socially Responsible Investing SRI/ESG guidelines. We currently manage a group of accounts for which we interpret the client guidelines and create a restricted list to synchronize with the investment management process.